Last night our time my oldest sister Marja died in the Netherlands. She was euthanised. I am not sharing this with you because of narcissism but because the Western Australian government also want to legalise doctor assisted dying and I believe that is a very humane intent. There are community information sessions and community consultation and a very long online survey that took me 20 minutes, but is worth doing. I am so grateful that my sister died in her own bed in her own home and with dignity and that she had plenty of time to receive family and friends and say goodbye. The process she had to go through was lengthy and very thorough before an expert committee decided that she was eligible for euthanasia. Legalising assisted dying is about giving people a choice instead of forcing them to commit suicide in awful and very lonely ways. It should not be politicised or being kidnapped by religious leaders. There is no threat to religious or cultural values. No one can be forced to be euthanised and neither can doctors be forced to administer it. In my sister’s case her new doctor-the old one had retired-told her it was too early in his young career to feel comfortable assisting her so she was referred to an older colleague. My sister Marja was assessed on her health and mental health by different practitioners who wrote reports which were considered by an independent panel. There was nothing easy or flippant about that process and not at all what some panel members at last year’s Notre Dame university forum claimed. Call me an old cynic, but it comes as no surprise to me that the billion dollar age care industry and the billion dollar palliative care industry are against euthanasia, and so are those who believe that only a god can take a life. For those of us who are not religious the promise of heaven, paradise or nirvana is irrelevant, but euthanasia is our pragmatic and humane choice if life is coming to a painful, slow and unstoppable end. We don’t let animals suffer, so why not apply the same compassion to human beings. It is astounding how unprepared we are for death. It is the elephant in the room that not many people want to talk about. We are not taught how to deal with it, so at the end we try to deal with it the best we can with empathy. I was lucky to be able to Skype with my sister often over the last couple of months and that was good for both of us. Marja was just three years older than I am and was always there for me. She had inoperable cancer. I am so grateful that she was allowed to die with dignity. All her pain and worries are now over. ARE YOU JUST A BIT OKAY TODAY? It is R U OK? Day today, a day where we are reminded off the very high rate of suicide and mental health problems in Australia. We even have a very high rate of youth suicide that is very disturbing. 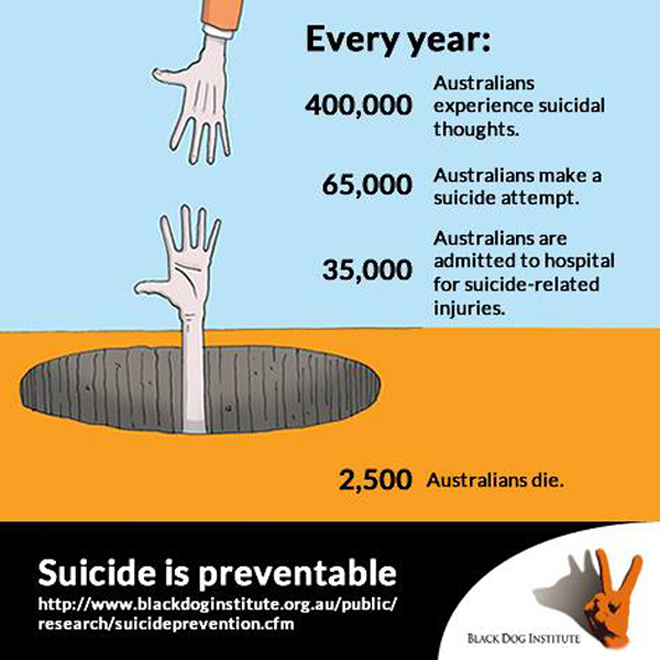 Of suicides in Australia 75% are committed by men who in our macho society still find it hard to seek help and that needs to change, as there is no shame in admitting that one is battling the black dog. When someone tells you they are not o.k don’t say that there are many people worse off, because it is totally irrelevant for those who are in the deepest, darkest and loneliest space in the universe in the jaws of the black dog. Depression and anxiety is not some selfish self-indulgence and feeling sorry for oneself, so being told to stop whingeing because other people are worse off is like being told that one is a loser who should stop the poor me attitude. Depression is a very frightening emotion where one sees no future and no way out of that huge black hole, and one believes that no one can help because no one understands. It is a deeply lonely battle where one feels absolutely abandoned by the world and all one wants is peace and to not wake up the next morning. Committing suicide is not a selfish and coward act but one of utter desperation because one sees no other way out. It is the most awful soul-destroying feeling of aloneness that is impossible for me to put in words. It makes me shudder to even think off it. The black dog keeps coming back in the most unexpected moments and when one believes one has won the fight. That awful pressure of anxiety in one’s chest is only made a little more bearable by hoping that it might be the start of a heart attack and that life will soon end, so that one hopefully does not have to commit suicide. It is easy to smile and show a stiffer upper lip and to answer I am okay when people ask, but deep inside one knows one is just a little bit okay for a short while, maybe a whole day, but many evenings we go to bed and ask the universe to not let us wake up tomorrow because we are so exhausted fighting depression. So thank you, I am okay today and will have great fun talking to many international visitors at the Roundhouse, and I sincerely wish and hope that YOU are okay as well! Comments Off on ARE YOU JUST A BIT OKAY TODAY? Anxiety Disorders Australia donated $5,000 of their remaining funds to Bluebird Mental Health at Ferns House in Fremantle’s High Street today. Previously known as GenWHY?, Bluebird is an up and coming mental health charity with a big vision: To be Australia’s leading provider of psychologist led, peer supported services championing adult mental health and wellbeing. Bluebird has achieved a great deal with very little funding, and has been able to provide support groups to over 390 individuals in 2015 from CBD locations in both Fremantle and Perth. Founded in 2009 Bluebird is the only organisation in WA dedicated to offering support groups facilitated by registered psychologists for over 25’s. In addition, Bluebird offers this services for free to all members, relying solely on private and grant based funding. Suicide remains the leading cause of death for all Australians between 15 and 44 years of age. Bluebird’s integrated program of support builds confidence and skills of members allowing them to manage their own anxiety and/or depression, reaching people in need before they become another statistic! Today is WORLD SUICIDE PREVENTION DAY and something we should all be aware of because far too many people in our society take their own life, often triggered by depression. Especially youth suicide should be of great concern to all of us and we need to ask how as a community we can support desperate kids better. In general though we should try to be more observant and that is difficult in world that wants to do everything faster and faster and where moments of contemplation have become more fleeting and rare. The world of ego-driven selfies has little time for those who need to sit down for a good deep talk where they can express their most inner feelings and dare to ask for help, so the sense on aloneness and despair increases and too often that results in suicide attempts. So ask, and keep asking R U OK? And you come back to Freo after stumbling 58,000 kilometres through Australia to find a place to die, and you start again, all over again not realising how much of your self-esteem has been sucked from you. You want to throw yourself back into the work you love doing, but have lost the confidence to go out and promote yourself, so you unconsciously create and artificial reality and build a cocoon around your depression. You become a social advocate then an activist, supporting minority groups, you get deeply involved with your community and local politics, you become a volunteer. Financially you start to struggle when the money from the sale of your house is drying up and not enough assignments are coming in, but after many years you even fall in love again. She is perfect of course until you find her in the arms of a friend. Your heart is broken and hatred destroys you, because she has taken what you valued most; trusting people. Life goes on, it has to, but the cocoon you have created around your depression is not strong and it bursts, and another suicide attempt is gone. You have to admit that you are not brave enough to pull it through. Whoever said that people who commit suicide are selfish cowards have no idea about the intense darkness and aloneness, where death seems to be the only solution. The despair is so deep that it physically hurts, it’s a pain-and the fear off it- that never leaves you. A few more failed love affairs and broken hearts, and little money left. Your lifestyle is getting worse and pulls you further down. What great relief and gratitude to have caring and generous friends and loans and food parcels, but it is equally devastating and demeaning. This is not the life you want to live. The noose comes back and with it the fear for eternal darkness. You want to be dead but don’t want to die. You just don’t want to wake up tomorrow. And the worst thing is to know that you will never feel the relief you crave for and that you will hurt the people you love. You feel like a total loser after that, someone who does not even get empathy from a medical professional. But friends push you through and the psychologist is more understanding. What even he does not understand though is that the fear to deal with the almighty government department is too overwhelming and that you can’t make that call, you just can’t. They all think it is so easy and no doubt it would fast-forward to some sort of outcome, but the overwhelming anxiety is debilitating. The amazing thing is that you are still very active and that you like who you are. You also realise that many people like you and even admire what you do, so you continue being the giver, he who does not charge for his services to help others, while being broke himself. You dream about helping others while being unable to help yourself. There does not seem to be a solution, but death, and that is hard to accept for someone who loves life and people. There is no end-yet-to this long journey that started in 1994. I am still here but it is getting harder each and every day. Who knows, maybe I’ll be lucky one day soon and I won’t wake up with a chest full of anxiety, and there won’t be a tomorrow.